This image was actually take during the wedding day at the end of the session. The bride, groom and myself were all walking back from the airport runway in Gibraltar after shooting with the ‘The Rock’ in the background and on the way back we walked past the local petrol station. 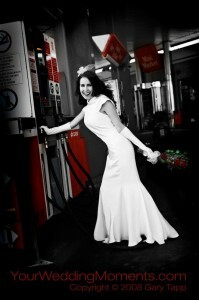 I couldn’t resist to ask the bride to jump in and grab the one of the pumps for the very last shots … and she did!